In 1962, he was created by exposure to gamma radiation in Incredible Hulk #1. 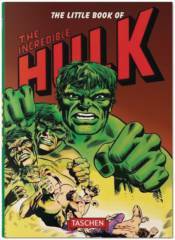 Not only did the Hulk fight anyone who got in his way, but his alter ego, Bruce Banner, fought the multiple personality disorder that transformed him, spawning many other versions of the Hulk, each of whom were aspects of Bruce's personality. Despite that, the Hulk took down the Leader, the Abomination, and Wolverine, among hundreds of other great villains. The star of a smash-hit TV show, two blockbuster movies, and hundreds of great comics, he's one of the most instantly recognizable characters in the world. Text in English, French, and German.